Sorry! The Competition has closed. The winners were Mike Barton, Gerry Law and IvorJ. Our congratulations to them. We'll post here their choice of site for the Poppy Wreaths as soon as we receive them. On the 11th and 12th November we 'Remembered'. We all did our bit, often in total silence. Others provided the sound that brings a lump to your throat as they play "The Last Post". Some provided the sound that brings a tear to your eye for the right reasons and some, like that whining and discordant guitar in the Albert Hall Ceremony on the 11th, for completely the wrong reasons! 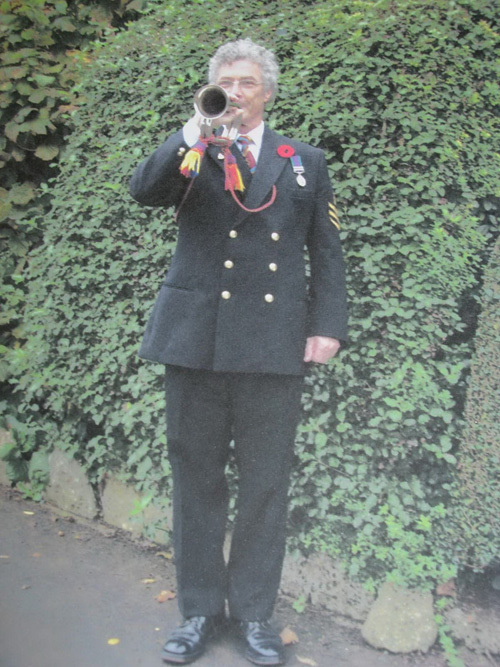 Here is a piccie of somebody 'doing their bit' for the RBL Poppy Appeal. Tell us something interesting about this image ... anything at all. Tell us what you see - or what is missing (Hint 1: The bugler is a British citizen). If you know his name - please do not ID him on the Public Forum ... he's shy! And yes .... dada da da ... there is a prize on offer. But this time it is different. Very different. The winner can have a poppy wreath placed on the grave of a family member in France or Belgium or on one of the Memorials to the Missing in either of those countries - you choose the site, we'll personally place the wreath which we obtain from the RBL thus adding to their cause. And we'll have a photograph taken of the occasion for you. Go on ... Have a Go! This competition is open to everyone except admin and BarryF - and that includes our indefatigable Fight4thePJM team leading this campaign who can take part as well. Remember (! ), every entry will go in the hat. Q: Does it have to be a family member? A: No. You can nominate any named grave or a Memorial to the Missing. Q: Can I nominate a Cemetery? A: Yes - we'll place the Wreath at the Cross of Sacrifice. Q: I'd like to nominate a grave of An Unknown Soldier - is that OK? A: Definitely - if you do not nominate a location, we'll pick one in a cemetery that is not often visited. Q: Does the grave, cemetery or memorial have to be British? A: Absolutely not - we do not distinguish between the fallen. Q: Can you help me find where a relative or friend is buried or remembered? A: We have very limited resources but will help if we can. First try "Search Our Records" on the Commonwealth War Graves Commission web site at http://www.cwgc.org. If unsuccessful and the casualty died in WW1 send whatever information you have to barry@fight4thePJM.org who will do a search on records of those who died in the Great War. For either of these searches, you will need both a name and a unit (preferably with the Bn number). Regimental number is very important (but not essential unless teh surname is e.g. 'Smith'). Date or year of death is also helpful. For those who died in Malaya-Borneo, try http://www.nmbva.co.uk - if you can get through the popups! NB: Due to our limited resources, unhappily we can only give help to those who enter The Bugler Comp.